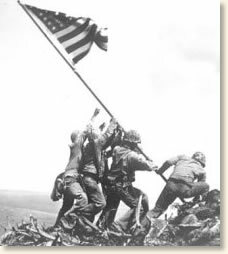 The photograph at the right of Marines raising the American flag at the summit of Mt. Suribachi during the battle for Iwo Jima has become an enduring image of bravery and heroism. However, this was actually the second flag raised on the mountain's summit that day. The first flag-raising occurred a couple of hours earlier - shortly after Marines had gained the top of the mountain after hard fighting. This flag was deemed too small to be easily seen from the base of the mountain so a second, larger flag was raised. Ross, Bill D., Iwo Jima: Legacy of Valor (1985); Wheller, Richard, Iwo (1980). "Raising the Flag Over Iwo Jima, 1945," EyeWitness to History, www.eyewitnesstohistory.com (2002). 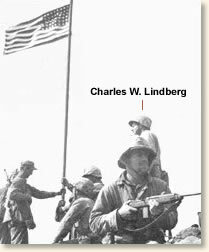 Marine Corporal Charles W. Lindberg passed away on June 24, 2007. He was the last remaining survivor of either of the flag-raisings on Iwo Jima during the battle for that island.